Whenever I mention hackathons, the usual response is “Is that where you hack into websites?”. In short, no, not usually. Hacking might be characterized as ‘an appropriate application of ingenuity’. Whether the result is a quick-and-dirty patchwork job or a carefully crafted work of art, you have to admire the cleverness that went into it. Later, hacker became synonymous with cracker, someone who violates security restrictions. 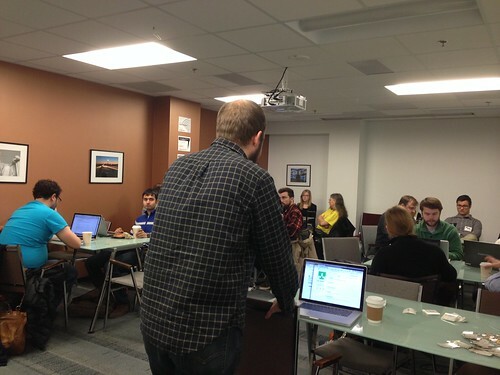 A hackathon is an event where individuals or teams work on a programming task. Some, like National Day of Civic Hacking, are opportunities to tackle challenges posted by government agencies or non-profits. Others, like AngelHack, involve building small-scale demos of startup ideas. Special access to products or services (like the Dun & Bradstreet Direct API) may be provided. 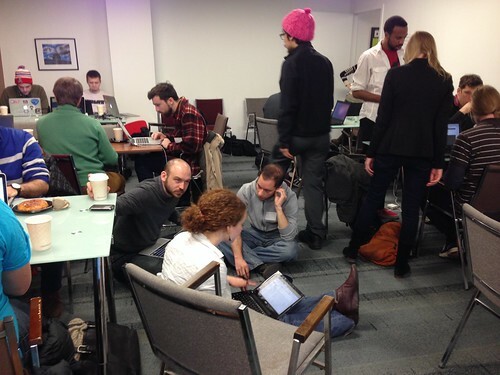 This past weekend I participated in the PDF Liberation Hackathon at the Sunlight Foundation in Washington, DC. Coordinated events were also held in five other cities. What follows is a condensed, stream-of-consciousness account of the weekend. Reception at Sunlight. Topics of conversation are mostly politics and transparency, but nothing technical. Good beer selection. Read the list of challenges. One from the U.S. Agency for International Development (USAID) looks interesting and tractable. Over 178,000 reports from 1947 to the present are archived in the Development Experience Clearinghouse (DEC). The majority are publicly-accessible PDF files, ranging from doctoral dissertations to “Weeds of Central America,a list of common and scientific names” (PDF). In addition to the files themselves, the DEC contains extensive metadata, such as publication date, author, abstract, and keywords. That’s the good news. The bad news: there ‘s no API and records can only be exported in batches of 50. Before diving in, check the Data.gov catalog for background info. Nothing. From the DEC help site, the software is Inmagic Presto 3.9. Search for reports of others scraping data from similar systems. More nothing. On search sites, q is usually short for query and those values look like Base64 encoding. What do they decode to? Aha! q matches the query displayed to the user, and qcf is a v4 UUID (GUID in Microsoft-speak) – perhaps a session ID? Can I just construct a query with the right syntax, Base64-encode it, and reuse the session ID? No such luck. Further inspection with Firebug reveals that almost every action on the site triggers an AJAX request. It seems the server maintains state for each session and assembles summary files for download on the fly. Maybe someone else will have more insight tomorrow. Put on my hackathon uniform (jeans, Hacker News t-shirt, and gray hoodie) and arrive at Sunlight a few minutes late (thanks WMATA single-tracking). Get plugged in, enjoy breakfast while waiting for everyone to arrive. Kat Townsend from USAID is attending. She confirms my analysis of the DEC and gives me some good news – submissions of old documents are rare, so a point-in-time metadata extract is viable. We brainstorm with Justin Grimes and commandeer a smaller room. Repeat steps 4-6 until metadata for all documents has been downloaded. After a few hours, I have a working script and the first few years downloaded. There are lots of holdups, like when I discover that the “Select All” button selects all records, not just those on the current page, which breaks the CSV download function. I have to modify the script to check each box directly, click “Select None” after downloading the CSV. As the number of documents per year grows, the server takes longer to respond. Because of the AJAX calls, it’s hard to know when the page is truly done loading. I find a handy snippet that uses jQuery.active in a WebDriverWait. I head home and plan to download more data overnight. Check results. Script crashed. No time to debug, back to Sunlight for the final push. Inspired by the WebDriverWait from last night, I write several more to make the script more resilient. After downloading data from the 1950s, I used the csvkit suite to inspect and merge the files. After pushing the merged files to GitHub, it’s time to think about my presentation. I present in DC, New York, and San Francisco simultaneously via Google Hangout. The DC judges deliberate and return to announce the local winners. First prize goes to What Word Where?, which brilliantly treats OCR output as geography, enabling code from GIS applications to assist with text extraction. Second prize goes to… me. Because the winning team includes Sunlight Foundation employees, they win a donation to the nonprofit of their choice, and I get the $300. Not bad for a weekend’s work. I’m continuing to extract, QA, and upload the metadata to https://github.com/pdfliberation/USAID-DEC. I hope to improve the error-handling in my code so it can run completely unattended and keep up with new DEC documents. If you have data locked up in a proprietary system that needs liberating, get in touch.